The Brunette Bubblecut Reproduction is the second in the My Favorite Barbie series issued in 2009 to celebrate Barbie's 50th anniversary. 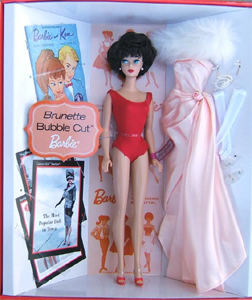 The set includes a reproduction 1962 Brunette Bubble Cut Barbie wearing her original Red Jersey Swimsuit and includes a reproduction of Enchanted Evening #983 (1960-1963), which comes fully accessorized. A reproduction vintage booklet is also included, along with 50th anniversary collectible cards that portray a vintage image reproductions on one side and Barbie facts on the back. This is the second in the My Favorite Barbie series, a series of six vintage Barbie reproductions to celebrate Barbie's 50th. It was released in January 2009 with a retail price tag of $39.95. Although an Enchanted Evening Reproduction was done in 1996, this is the first Bubble Cut to be reproduced in her original swimsuit.